A World Food Organisation (WFO) study showed that over 65% of the children at UMV were malnourished. As a result the WFO began a food programme at UMV, which provided a cooked meal at school for children under 14. This was part of a national programme started in 2007. As the price of wheat and other grains soared worldwide, the WFO found it impossible to continue with the programme at UMV. Senehasa decided to step in and from July 2008, Senehasa has run the food programme at UMV. 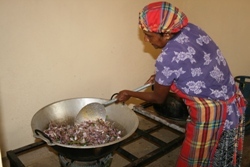 The Senehasa Food Programme not only feeds children under 14 – it includes all the students at UMV. Funding is now provided by the Government to feed children in Grades 1-5 but it is received in arrears and sometimes many months late. Senehasa therefore provides interim funding to ensure that there is money to feed the children every day. Senehasa provides the dry goods such as rice and dhal in bulk and then gives the school a “per child” allowance for fresh ingredients each day. Seven mothers come in early and begin preparing a simple yet nourishing meal of rice, dhal, egg or fish curry and a leaf curry. The children are also given a cup of milky tea before school each day. After over a decade, the benefits of the food and milk programmes are evident now. The children have gained weight and are healthier, school attendance is nearly 100% and academic results have improved. Giving children a daily nutritious meal is essential for them to benefit from their education. In 2013, Senehasa built and equipped a new kitchen at SGV. The children in this area come from very poor families and we knew they would benefit greatly from a daily meal. 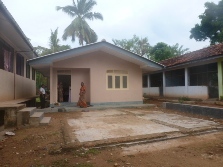 The building took several months but eventually an auspicious day was chosen and the kitchen was blessed in November 2013. Major events like opening new buildings are marked by a Buddhist ceremony in which milk is heated until it boils over, signifying prosperity. Meals have been served to the 400 children at SGV since the middle of January 2014. Three volunteer mothers come every day to cook a simple meal that is served to the whole school in their classrooms at morning break. The children have rice or gram (chick peas) every day with a selection of one or two curries such as egg, pumpkin, lentils, fish, sprats, plantain, banana flower, soya, leeks, onions, carrots or manioc (cassava). The cooks are doing a great job and the children are really enjoying the meals. A milk programme was also introduced at SGV and the children receive a cup of milk before school starts each day.